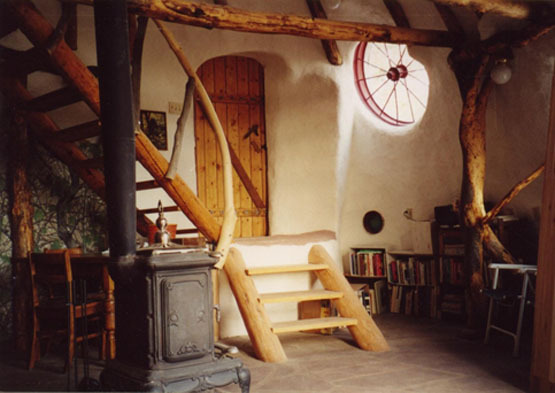 "Natural building" has become a catch phrase for a variety of building techniques that generally employ unprocessed natural materials, such as earth, stone, and straw. The focus is mainly on the material itself, and to some extent the methods that are used to work with the material, rather than the architectural design or other aspects of building that might be explored. If the phrase is reversed to "building naturally," this opens up a whole new level of consideration. Just what does it mean to build naturally , or to build with nature ? If we use the natural world as a guide for how to build our homes, we could look to other animals and see how they do it. Whatever they use to build with will be found locally; they don't waste energy carrying things great distances. 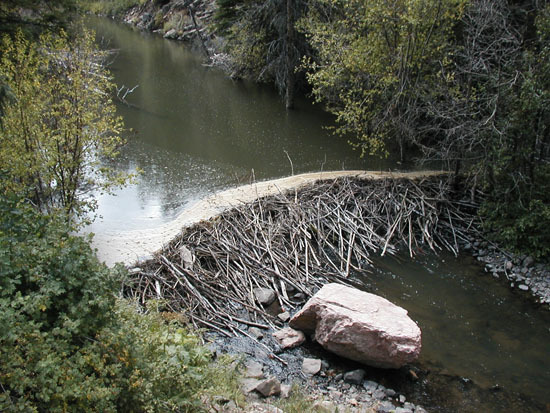 Beaver cut saplings along the creek bed to dam the stream and create a fortified home. Birds collect twigs and grass to make their nests. Some wasps gather mud to form protected space for their young. Many animals don't carry materials at all; they simply convert an existing hole or niche as a suitable home, much as our ancestors used caves or rock overhangs for shelter. 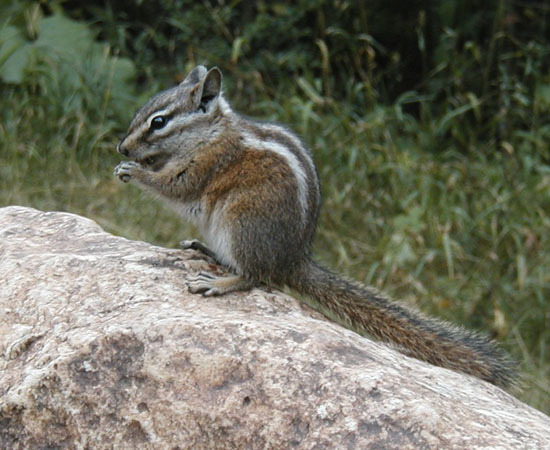 Some animals do process the materials they find to render them suitable for building. Certain termites mix the soil with saliva to make a hardened shell; some wasps make a thin paper-like material to fashion their nests. But they always start with the materials at hand, and they process them minimally. This processing is done without tremendous expenditure of energy, and employs no complex technology. All of the housing that animals (other than man) create is biodegradable. Given time, the sticks in the dam will rot, as will the bird's or wasp's nests. There is no build up of waste materials that would litter or pollute the environment. Sometimes things are recycled, such as a hermit crab claiming a castoff shell for a home. Furthermore, the homes that animals create are inherently non-toxic, because they build from entirely benign natural materials. The use of toxic materials would clearly not be appropriate for a species over time. In the natural world animals tend to find elegant solutions for dealing with the adversity of climate. Many of them go underground for protection and comfort. This is a sensible approach, since the earth can buffer the extremes of temperature amazingly well, while also providing a secure and dry nesting place. Advocates of underground architecture know this, and also appreciate that building underground can release much of the utilized land back to nature for the use of plants and animals. There is an efficiency and economy of nature that prevails because it works over time. Those animals that operate beyond this law eventually find themselves extinct or severely compromised in their vitality. If a species overpopulates an area to the point of depleting some of the natural resources that they depend on, then obviously they will have to move on to thrive.and this strategy may only work for awhile. Eventually all ecology must come into some degree of balance and equilibrium. We humans must take a serious look at how we acquire and utilize available resources for materials and energy. We have been fouling our nest with industrial pollution, over-harvesting available resources, and adversely affecting the climates and environments that all species depend on for survival. Building with nature means being aware of how much embodied energy exists in the materials that we use, so that we don't unnecessarily squander fossil fuels and contribute to global warming. It means building compactly so as to not waste materials and energy. It means using materials that are biodegradable or recyclable. It means designing our homes in ways that use the sun and the earth to heat and cool them. It means utilizing forms of renewable energy wherever possible. It means incorporating greenhouses and naturally cooled pantries in our homes to help feed us. In terms of architectural design, nature offers a kaleidoscope of inspiring forms. The shapes of shells, flowers, crystals, molecules, feathers, coral, planets, galaxies, and everything in between, can inform our architectural choices. Given this, it seems strange to me that we have generally been content to live in rectangular boxes, a form that nature rarely uses. It is tempting to ascribe this to the constrictions placed on design by the prevalence of planar industrial materials, and this is certainly part of it, but in fact many primitive dwellings have been rather rectilinear. Examples of this are the Native American dwellings at Chaco Canyon and Casas Grandes, Mexico , which were small cubicles built from stones, mud, grass and small trees. Perhaps such rectangular forms may have been avant garde attempts at new architectural expression, going beyond the old circular huts. It is interesting, though, that the kivas that housed the ceremonial and spiritual functions of these societies continued to be circular in form. Why do we think in such straight lines? Maybe we feel that it puts us above nature, which is certainly a tendency of modern man. Flipping though the pages of a current architectural digest leaves me feeling coldly disconnected from the natural world. The preponderance of rectilinear shapes stifles my imagination and dampens my spirit. I much prefer to feel deeply and integrally connected with the world around me, rather than cut off from it. I have witnessed the reactions of hundreds of people who have entered my home, which is almost entirely rounded in form and composed of natural materials. Almost without exception, they have expressed delight and wonder. After being in the space for awhile, most of them will say something like, "I feel so cozy here, like I am being embraced by the building!" This is an emotional response that is rarely evoked by a squared room. There is good reason why nature prefers round forms: they tend to be much stronger than their planar cousins. A curved shape resists deformation, whereas flat shapes can more easily be deflected. Think of the rigidity of an eggshell as compared to a piece of paper of the same thickness. Mostly people build according to tradition. If you ask a child to draw a house, he will usually produce the conventional box with a gabled roof, a window, a door and maybe a chimney with smoke coming out of it. Our culture has imprinted this on our minds. There is nothing inherently home-like about this; it is just what we are familiar with. I encourage you to think "out of the box" and let nature be your guide for how to create your home and live your life.